Books Are Sanity!!! : Wedding Belles by Melanie Jacobson, Jennie Proctor, Becca Wilhite and Brittany Larsen, New Release & Review! 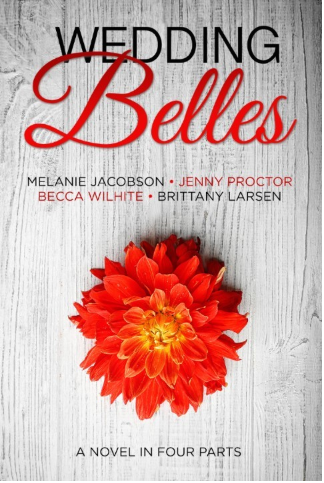 Wedding Belles by Melanie Jacobson, Jennie Proctor, Becca Wilhite and Brittany Larsen, New Release & Review! So, let's talk about a novel in four parts...I was like, what the heck? How is this going to shake out with four parts, four authors...can this be successful and even somewhat cohesive? You guys! It was AH-mazing! Each part was one couple's story yet each story interlocked with the entire whole of the novel! How these four authors managed to pull this off, I will never know! But what I do know is that each part was engaging, interesting, and easy to read. Each part was connected to each other and the four parts made one beautiful interlocking story. As a reader I loved that I got to read four different stories that all made up one big story. For me it was a huge bonus...it was like extra helpings of dessert, you can never get enough! If you like easy reading, romance, chick lit, and all of that beautiful stuff...then you will definitely love Wedding Belles and this reader highly recommends it!